Hortus Camdenensis | Watsonia marginata (L.f.) Ker-Gawl. Cormous perennial with broad, to 50mm wide, sword-shaped leaves and branched stems of few to many tubular, mauve-pink flowers, rarely white or purple, with white and purple markings in spring and early summer. To 2m. [RHSE, Hortus, CECB]. ‘Introduced into Kew Gardens, by Mr. Masson in 1774. A sure blower about July or August, requiring a very deep pot. Propagates rapidly by seeds or offsets, and is now one of the commonest of its tribe, known among nurserymen under the name of Ixia sceptrum. Owing to the intimate union of the spikelets with the main spike it appears as if it began to flower at the middle; but, on examination, will be found to begin at the base of the primary spike, as is usual with its congeners.’ [BM t.608/1802]. 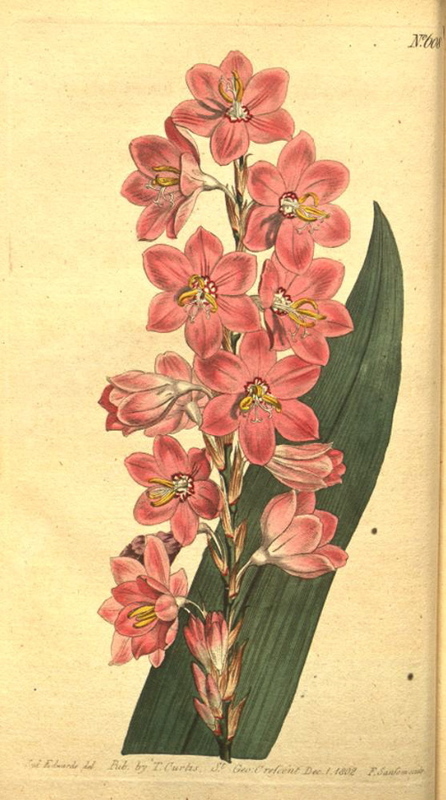 ‘The present variety [Watsonia marginata minor] was introduced last year from the Cape of Good Hope.’ [BM t.1530/1813]. Received per ‘Sovereign’ February 1831 [MP A2948] and listed in all subsequent catalogues [B.446/1843]. Antholyza marginata Page ex Steud.